Our knowledge of ancient Egyptian is the result of modern scholarship, for since the Renaissance, a symbolical and allegorical interpretation was favored, which proved to be wrong. The learned Jesuit antiquarian Athanasius Kircher (1602 - 1680) proposed nonsensical allegorical translations (Lingua Aegyptical restituta, 1643). Thomas Young (1773 - 1829), the author of the undulatory theory of light, who had assigned the correct phonetical values to five hieroglyphic signs, still maintained these alphabetical signs were written together with allegorical signs, which, according to him, formed the bulk. The final decipherment, starting in 1822, was the work of the Frenchman Jean-François Champollion, 1790 - 1832, cf. Précis du système hiéroglyphique des anciens égyptiens par M.Champollion le jeune, 1824. Champollion, who had a very good knowledge of Coptic (the last stage of Egyptian), proved the assumption of the allegorists wrong. He showed (especially aided by the presence of the Rosetta Stone) that Egyptian (as any other language) assigned phonetical values to signs. These formed consonantal structures as in Hebrew and Arabic. He also discovered that some were pictures indicating the category of the preceding words, the so-called "determinatives". After Champollion's death in 1832, the lead in egyptology passed to Germany (Richard Lepsius, 1810 - 1884). This Berlin school shaped Egyptian philology for the nineteenth and twentieth centuries, in particular scholars such as Adolf Erman (1854 - 1937), Kurt Sethe (1869 - 1934), who, together with Francis Griffith (1862 - 1934), Battiscombe Gunn (1883 - 1950) and Alan Gardiner (1879 - 1963) in England, laid the systematic basis for the study of Egyptian. Later, Jacob Polotsky (1905 -1991) established the "standard theory" of Egyptian grammar. These efforts finally made the historical record available to scholars of other disciplines, so that through interdisciplinarity, the impact of Pharaonic Egypt on all Mediterranean cultures of antiquity could be weighed. The result being, that Ancient Egypt is no longer neglected in the history of the formation of the Western intellect. Davies, W.V. : Reading the Past : Egyptian Hieroglyphs, 1987. Hiéroglyphes : écriture et langue des Pharaons, CD-Rom, Khéops - Paris, 2001. Colling, M. & Manley, B. : How to read Egyptian hieroglyphs, 2001. Gardiner, A. : Egyptian Grammar, 1982. Du Bourguet, P. : Grammaire Egyptienne, 1980. Lefebvre, G. : Grammaire de l'Égyptien classique, 1955 (2 volumes). Allen, J.P. : Middle Egyptian, 2000. Budge, E.A.W. : A Hieroglyphic Vocabulary to the Book of the Dead, 1911. Budge, E.A.W. : An Egyptian Hieroglyphic Dictionary, 1920 (2 volumes). Erman, A. : & Grapow, H. : Aegyptisches Handwörterbuch, 1921. Faulkner, R.O. : A Concise Dictionary of Middle Egyptian, 1972. Van der Plas, D. : Coffin Texts Word Index, 1998. Hannig, R. : Ägyptisches Wörterbuch I, 2003. The first hieroglyphs of the Egyptian language, often attached as labels on commodities, were written down towards the end of the terminal predynastic period (end of the fourth millennium BCE). There is a continuous recorded until the eleventh century CE, when Coptic (the last stage of the language) expired as a spoken tongue and was superceded by Arabic. Archaic Egyptian (first two Dynasties), Old Egyptian (Old Kingdom), Middle Egyptian (First Intermediate Period & Middle Kingdom), Late Egyptian (New Kingdom & Third Intermediate Period), Demotic Egyptian (Late Period) and Coptic (Roman Period). In the last two stages, new scripts emerged and only in Coptic is the vocalic structure known, with distinct dialects. Archaic Egyptian consists of brief inscriptions. Old Egyptian has the first continuous texts. Middle Egyptian is the "classical form" of the language. Late Egyptian is very different from Old and Middle Egyptian (cf. the verbal structure). Although over 6000 hieroglyphs have been documented, only about 700 are attested for Middle Egyptian (the majority of other hieroglyphs are found in Graeco-Roman temples only). Egyptian hieroglyphs is a system of writing which, in its fully developed form, had only two classes of signs : logograms and phonograms. A logogram is the representation of a complete word (not individual letters of phonemes) directly by a picture of the object actually denoted (cf. the Greek "logos", or "word"). As such, it does not take the phonemes into consideration, but only the direct objects & notions connected therewith. A writing system exclusively based on logography would have thousands of signs to encompass the semantics of the spoken language. Such a large vocabulary would be unpractical. Moreover, which pictures to use for things that can not be easily pictured ? How to address grammatics ? Egyptian phonography (a word is represented by a series of sound-glyphs of the spoken sounds) was derived through phonetic borrowing. Logograms are used to write other words or parts of words semantically unrelated to the phonogram but with which they phonetically shared the same consonantal structure. The logogram , signifies "mouth". It is used as a phonogram with the phonemic value "r" to write words as "r", meaning "toward" or to represent the phonemic element "r" in a word like "rn" or "name". This pictoral phonography is based on the principle of the rebus : show one thing to mean another. If, for example, we would write English with the Egyptian signary, the word "belief" would be written with the logograms of a "bee" and a "leaf" ... The shared consonantal structure allows one to develop a large number of phonograms. They are the solid architecture of the language. In Egyptian, the consonantal system was present from the beginning. triconsonantal hieroglyphs : three successive consonants (ca. 50). This phonography allowed a word of more than one consonant to be written in different ways. In Egyptian, economy was exercized and spellings were relatively standardized, allowing for variant forms for certain words only. Logograms are concerned with direct meaning and sense, not with sound. Likewise, Egyptian used so-called "determinatives", derived from logograms, and placed them at the end of words to assist in specifying their meaning when uncertainty existed. A stroke for example was the determinative indicating that the function of the hieroglyph was logographic. The determinative specified the intended meaning. Some were specific in application (closely connected to one word), while others identified a word as belonging to a certain class or category (the generic determinatives or taxograms). Determinatives of a word would be changed or varied to introduce nuance. 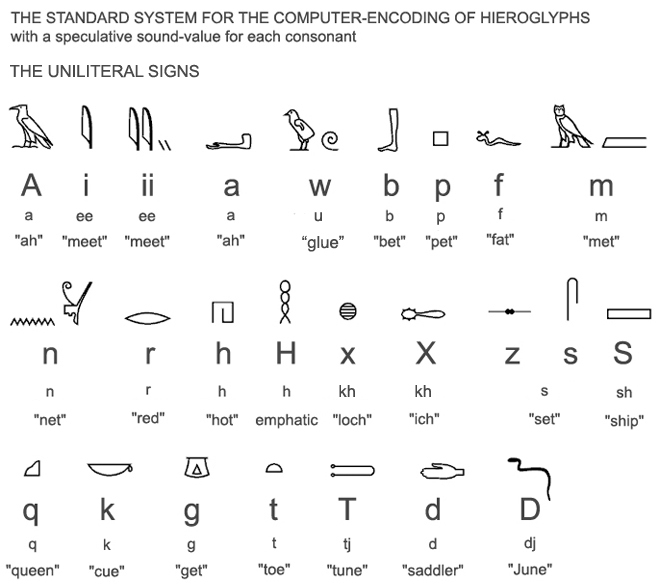 The same hieroglyph can be a logogram, a phonogram and a determinative. The logogram , depicting the sun, signifies : "sun" (in continuous texts, a stroke would be put underneath the hieroglyph to indicate a purely logographic sense). Placed at the end of words, it is related to the actions of the sun (as in "rise", "day", "yesterday", "spend all day", "hour ", "period") and so the hieroglyph is a determinative. In the context of dates however, it is a phonogram with as phonetic value "sw". Besides these purely semantical functions, the determinatives also marked the ends of words and hence assisted reading. They helped to identify the "word-images" in a text. Once established, these were slow to change, causing, as early as the Middle Kingdom, great divergences between the written script, becoming increasingly "historical", and the spoken, contemporary pronunciations. Logograms and determinatives are both ideograms. Pictoral ideography (a variety of hieroglyphs representing idea's, notions, contexts, categories, modalities or nuance's) conveys additional meaning. Ideograms are purely semantical (or semograms). To the objective sound-glyph (the phonetics, in this case, being the consonantal structures with no vocalizations) an ideogram is added changing the overall meaning. Hieroglyphic writing remained a consonantal, pictoral system, allowing for both phonograms and ideograms to convey meaning. 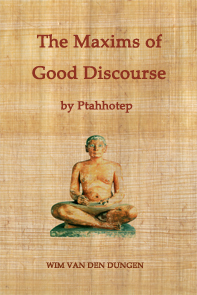 Ante-rational cognition and Archaic, Old and Middle Egyptian. Before the differentiation between the spoken and the written language, no identification and transmission of meaning was possible, except through oral means. Insofar as the ability to identify conscious activity was concerned, only anonymous cultual productions prevailed. Mythical memory produced its tales, legends and typical designs. No individual consciousness can be denoted. The differentiation between, on the one hand, nature and its processes and, on the other hand, human consciousness is very small or completely absent. The graven images found in graves, point to the start of the first decentration and the rise of the idea of objectifying meaning in picture-glyphs (beginning of logography ?). This slow process of objectification gave rise to the experience of spatiality : navigation on the Nile and the emergence of cult centers and urban centers, associated with chiefdoms, principalities, provincial states and village corporations, finally united into regional kingdoms. Trade continued to flourish and wealth distinctions became more salient. The subject experienced itself for the first time as source of cultural actions. Differentiation (between object and subject) led to logico-mathematical structures, whereas the distinction between actions related to the subject and those related to the external objects became the startingpoint of causal relationships. The grammar of ware design is used, allowing for the decentration of actions with regard to their material origin, for now myths could be recorded in schemata which could be objectified by later subjects. The linking of objects was also evident. Means/goals schemata rose. The dependence between the external object and the acting body was mediated by elementary rules of design and cultural dressing. These schemata led to spatial & temporal permanency. This process of interiorization (starting with the first decentration and ending with the exhaustion of the mythical mode of thought) led in the terminal predynastic period to an entirely new subjective focus which exteriorized itself in single hieroglyphic writing. This event defined the most important breach with the past : the end of the exclusivity of the mythical mode of thought and its already complex spoken language and the start of the history of Ancient Egypt. The advent of political unification is consistent with this radical change. In the mythical "first time" (zep tepy), the "primordial hill" (benben) emerged out of the undifferentiated. In the passive principle (Nun), the active (Tatenen) lay dormant. In the resulting Ennead, 4 feminine & 4 masculine deities formed a balanced Ogdoad + a "Great One" (Atum or Re or Ptah or Thoth or Amun-Re). The active pole drew its "force" out of the balanced passive Ogdoad (reminiscent of the pre-creational primordial Ogdoad of chaos-deities - cf. Hermopolitan theology). The final unification of the Two Lands became possible thanks to the centralizing, masculine role of Pharaoh and his justice & truth. He was the falcon who oversaw everything, the witnessing eye. Instead of the emergence of conscious focus out of the inert, there came the conscious awareness drawn from the panoramic overview. This presence of the "Followers of Horus", was like the divine-on-earth (not the divine-in-the-sky). The masculine is not drawn from (or constructed upon) the feminine (as in the natural order), but the feminine is assimilated by the masculine (as in the cultural order). The "onanism" of Atum may also be linked with this connotative field, for masturbation does not serve procreation (neither does taking seed in one's mouth). The proto-typical battle between Horus and Seth is one in which the feminine is totally absent. This formidable political unification needed its landmarks. 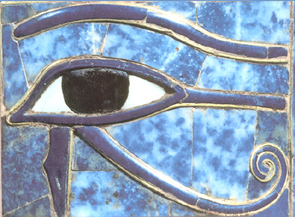 The "Followers of Horus" became divine ancestors. They had to create a material blueprint of their presence. The divine power of words being very firmly established, no elaborate hieroglyhic writing was called upon. A few signs in stone sufficed. The rise of semiotics transformed the sound-glyph into logograms & phonograms. The fact phonograms and logograms were used in an outstanding, monolithic way (hand in hand with artistic pictoral representations) shows the need to exteriorize, in heraldic fashion, this collosal attainment around 3000 BCE (unification) and the foundation of the Dynastic Age (Dynasty I & II). When the difference between subject and object became a sign, a higher mode of cognition could be expressed. This involved the written language to realize its first internal structure, so words could be joined together in simple sentences. Internalization led to the formation of pre-concepts, i.e. word-images created through imagination and the interplay of meaningful objective relational contexts. Subjectivity was expressed as a function of an objective state. The actions of the "I"-form are objective states which are not yet (self) reflective. The opacity of the material side of presence prevailed. The subject has no transparancy of its own. "King of Upper and Lower Egypt, Favorite of the Two Goddesses, Lord of Truth, Golden Horus : Snefru, Great God, who is given satisfaction, stability, life, health, all joy forever. Horus : Lord of Truth. Smiter of Barbarians." Sinai Inscriptions of Snofru, rock-walls of the Wadi Maghara in the Peninsula of Sinai and palace façade (the "banner"), translated by : Breasted, 2001, p.75, § 169. The earliest biography is of Methen, who died in the reign of Snefu, but who's affiliations were with the preceding Pharaohs. His was the story of the gradual rise of a scribe to overseer of provisions, and governor of towns and districts in the Delta. He also was deputy in the eastern part of the Fayum and the 17th Anubis nome (Upper Egypt). He was amply rewarded and tells the reader about the size of his house with an account of the grounds. He was buried near the terraced pyramid of Zoser of the earlier part of Dynasty III. "He was made chief scribe of the provision magazine, and overseer of the things of the provision magazine. He was made (...) becoming local governor of Xois, and inferior field-judge of Xois. He was appointed judge, he was made overseer of all flax of the king, he was made ruler of Southern Perked and deputy, he was made local governor of the people of Dep, etc ..."
Biography of Methen, from his mastaba-chamber in Sakkara, Berlin Nos.1105-1106, translated by : Breasted, p.77, § 172. In 400 years, the written language had considerably developed. But although words could be joined together in simple sentences and the latter in pragmatical groups (dealing with honors & gifts, offices, legacies, inventories, testaments, transfers, endowments, etc. ), the additive, archaic quality of the style remained. The composition between these groups was loose or absent. Subjectivity was still objectified. Pre-operatoric activity is limited by the immediate material context. Writing reflected the part one had played in the state. The Pyramid Texts have their own particular problems and difficulties. They are a set of symbolical "heraldic" spells mainly dealing with the promotion of Pharaoh's welfare in the afterlife. These spells were recited at various ceremonies, mostly religious and especially in connection with the birth, death, resurrection and ascension of Pharaoh. These texts are to a large extent a composition, compiling and joining of earlier texts which circulated orally or were written down on papyrus a couple of centuries earlier. Some of them go back to the oral tradition of the Predynastic era, for they suggest the political context of Egypt before its final unification. The relative rarity of corruptions is another important fact making their study rewarding. However, these texts are pre-rational because they are an amalgam of thoughts in which contradictions occur which are left intact (between the Heliopolitan and Osirian elements). In harmony with the writing practice of the Egyptians, older structures were mingled with new ones and many traces of earlier periods remained. The extent with which this layeredness took shape is rather pronounced. The language itself has the style of the "records" of the Old Kingdom, often additive and with little self-reflection (which starts with the First Intermediate Period). These Pyramid Texts are the culmination of pre-rationality. In this collection, no epics or drama is to be found. Didactic poetry (precepts) and lyrics in which personal emotions & experiences are highlighted are nearly absent. The texts mainly deal with religious & political literature. One of the common forms of this literature was the litany-like scheme. We also find hyms & songs of triumph. Stylistically, the texts reveal that parallelism and paranomia are numerous. Various types of parallelism can be observed : synonymous (doubling or repetition), symmetrical, combined, grammatical, antithetic, of contrast, of constraint, of analogy, of purpose and of identity. Metrical schemes of two, three, four, five, six, seven or eight lines occur (the fourfold being the most popular). The play of words is the commonest literary feature and depends on the consonantal roots of the words. Alliteration, metathesis, metaphors, ellipses, anthropomorphisms and picturesque expressions are also found. ► early proto-rational writing ? The administration of the Pharaonic State was considerable. The need to develop the language rose. In the Old Kingdom, we see the rise of three independent literary genres : religious poetry, sapiental instructions and the biography. The literary style of the period reflects the tranquil security of and unshaken faith in the power of kingship. At a certain point, these realized interiorizations became operations, allowing for transformations. The latter make it possible to change the variable factors while keeping others invariant. Conceptual and relational structures arise. We see an increase in the formation of coordinating conceptual structures capable of becoming closed word-images by virtue of a play of anticipative and retrospective constructions of thought (imaginal thought-forms). This anticipation is clearly attested in the legal documents. Retrospection was also firmly established. A good example of this early proto-rational writing are the Maxims of Ptahhotep. Here the rhetorical device of playing with words having identical consonantal skeletons was used. In other texts, identical grammatical formulæ are repeated, and ready made groups of word-images are used. "Ensuite, il faut avouer qu'à notre goût la composition paraît décousue. Des conseils de civilité puérile et honnête voisinent avec des fines remarques psychologiques. Mais si la forme de notre exprit exige une organisation rationnelle et un classement de matières, l'alternance de conseils de politesse et une tentative, requérant l'effort, pour modifier son propre caractère, est peut-être pédagogiquement excellente et résulte d'une grande expérience de l'enseignement." Daumas, 1987, p.354, my italics. 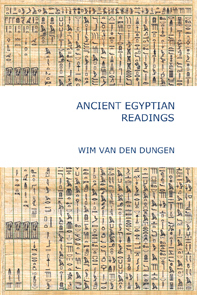 The Middle Egyptian of this and other text from Dynasty VI (cf. the Instructions of Kagemni), may be explained as resulting from only minor alterations, for the end of Dynasty VI and the beginning of Dynasty XI are only a hundred years apart. Moreover, many of the forms characteristic of Middle Egyptian are found in the biographical inscriptions from Sixth Dynasty tombs. Dynasty VI is hence transitional. Also politically, for the importance of the provinces had risen, preparing the great changes introduced in the First Intermediate Period and in the Middle Kingdom. In the Discourse of a Man with his Ba and the Complaints of Khakheperre-sonb the acquired introspection leads to inner dialogues (in the first work between the "I" and its "soul", in the second between the "I" and its heart). was able to specify meaning otherwise than through determinatives and ideography. Furthermore, the position of a noun in the sentence determined whether it was the subject or the object of a verb. The normal word order being : verb + noun-structure + noun-object. Complex sentences (with more than one subsentence) were rare, and the meaning of a sentence could only be derived one step at a time. This concrete, proto-rational writing contained a paradox : a balanced development of logico-mathematical operations was evident, but the limitations imposed upon the concrete linguistic operations pushed the language to move beyond this. The Story of Sinuhe shows the complexity arrived at. The composition contained a lot of variety : narration, hymn, epic, monologue, dialogue, copy of a royal letter and epistle-like response with stereotypical expressions ... This work is also a psychological novel, explaining the adventures of its hero on the basis of his character. The style of the writing is of an elegant simplicity and the verbal forms have been carefully chosen. The narrative style is organized by rhythmical prose using parallelism and constituting a veritable religious song. The verbal structure developed, but the pictoral, consonantal and ideographic limitations were kept in place. Just like the New Solar Theology was able to naturalize the deities without eliminating the old pantheon, so were new linguistic innovations introduced side by side the "old" language. This conservative tendency was one of the chief causes of the layeredness of the language and suited the "multiplicity of approaches" (cf. Frankfort) extremely well. Old forms (although syntactically problematic) were retained because of the divine nature of words and the idealization of the Old Kingdom. In the New Kingdom as well as in the Late Period, archaism were savoured because the ancient word-images were believed to arouse the Kas of old and hence provide the necessary magical succession. To change a pattern for formal reasons was deemed less important than to maintain a wrong combination which had proven its magical merits. We therefore see in pre-rational writing the remnants of mythical thought at work, and this by virtue of its psychomorph features. The presence of Predynastic material in the pre-rational Pyramid Texts is attested. In proto-rational writing, these confusions were at times left behind (cf. Great Hymn to the Aten). Amarna theology banished the old pantheon. Only the light-presence of the Aten, absolutely alone, was divine, just as Pharaoh, son of the Aten, receptacle of the revelations of the Aten and teacher. However, after Amarna, the ante-rational confusion of object & subject was restored (together with its foundational mythical identifications) and the plurality of contexts was never conceptually transcended by means in a theoretical form. Insofar as Ancient Egyptian civilization as a whole is concerned, the decontextualization of meaning in an abstract theoretical form never took place. The language remained layered and archaic elements were sometimes introduced or copied to give the text a feeling of antiquity (for that reason, the Memphis Theology was regarded as an Old Kingdom text). Pictoral representations elucidating the text remained in place (cf. the vignette), as well as a type of ideogram called "orthogram" or "calligram", which conveyed neither meaning nor sound but was written for aesthetic reasons & pleasure. The cultural form of Ancient Egyptian civilization remained at the level of the concrete operations. Archaic Egyptian = mythical : the myth of divine writing - single hieroglyphs as divine passage-ways to the divine - cartoon-like messages (pictures accompanied by logograms & phonograms). This phase ends with single inscriptions without grammar, culminating in loose pictoral narratives assisted by a few phonograms (Palette of Narmer). Old Egyptian = pre-rational & early proto-rational : the actual initiation of writing - written monuments for practical purposes - the first pre-rational linguistic structures appear - single sentences with simple forms - the emergence of contextualizing determinatives - beginning of anticipation & retrospection - single word-images forming groups which convey a particular style - the differentiation of literary genres - sapiental writings. 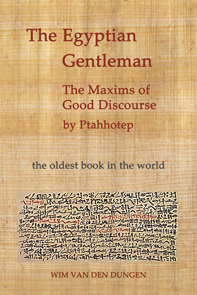 This phase ends (in the late VIth Dynasty) with sentences in a particular style, able to convey in a short and laconical way insights of incredible depth (Maxims of Ptahhotep). the benefit of the doubt (Zába) : amendments should be introduced with great caution and for very good reasons. Indeed, some egyptologists change the original text with great ease, considering Egyptian scribes to be careless and prone to mistakes. This is not correct. Zába (1956, p.11)) prompted us to respect the original text and made it his principle. He wrote : "Pour ce qui est la traduction d'un texte égyptien dans une langue moderne, l'étude de divers textes (...) m'a amené au principe dont je me suis fait une règle, à savoir de considérer a priori un texte égyptien comme correct et de m'en expliquer chaque difficulté tout d'abord par l'aveu de ne pas connaître la grammaire ou le vocabulaire égyptien aussi bien qu'un Egyptien. (...) et ce n'est donc qu'après avoir longement, mais en vain, consulté d'autres textes et ne pouvant expliquer la difficulté autrement, que je suis enclin à croire que le texte est altéré." multiple approaches (Frankfort) : this notion implies one has to assimilate the Egyptian way of thinking before engaging in explaining anything. Their "method" not being linear, axiomatic (definitions & theorema) or linea recta. Frankfort (1961, pp.16-20) explains : "... the coexistence of different correlation of problems and phenomena presents no difficulties. It is in the concrete imagery of the Egyptian texts and designs that they become disturbing to us ; there lies the main source of the inconsistencies which have baffled and exasperated modern students of Egyptian religion. (...) Here then we find an abrupt juxtaposition of views which we should consider mutually exclusive. This is what I have called a multiplicity of approaches : the avenue of preoccupation with life and death leads to one imaginative conception, that with the origin of the existing world to another. Each image, each concept was valid within its own context. (...) And yet such quasi-conflicting images, whether encountered in paintaings or in texts, should not be dismissed in the usual derogatory manner. They display a meaningful inconsistency, and not poverty but superabundance of imagination. (...) This discussion of the multiplicity of approaches to a single cosmic god requires a complement ; we must consider the converse situation in which one single problem is correlated with several natural phenomena. We might call it a 'multiplicity of answers'." integral acceptation (Zimmer) : in his study of Eastern religions and exegesis of Hindu thought, the German scholar Heinrich Zimmer introduced a principle which implies that before one studies a culture one has to accept it exists or existed as it does and claims. One should approach and interprete its cultural forms as little as possible with standards which does not fit in, which focus on subjects which were of no interest to it (like the colour of the hair of royal mummies) or which reduces it to what is already known. This means one, as does comparative cultural anthropology with its methodology of participant observation, accepts the culture at hand without prejudices and projections. Zimmer (1972, p.3) explains himself : "La méthode -ou, plutôt, l'habitude- qui consists à ramener ce qui n'est pas familier à ce que l'on connaît bien, a de tout temps mené à la frustration intellectuelle. (....) Faute d'avoir adopté une attitude d'acceptation, nous ne recevons rien ; nous nous voyons refuser la faveur d'un entretien avec les dieux. Ce n'est point notre sort d'être submergés, comme le sol d'Egypte, par les eaux divines et fécondantes du Nil. C'est parce qu'elles sont vivantes, possédant le pouvoir de faire revivre, capables d'exercer une influence effective, toujours revouvelée, indéfinissable et pourtant logique avec elle-même, sur le plan de la destinée humaine, que les images du folklore et du mythe défient toute tentative de systématisation. Elles ne sont pas des cadavres, mais bien des esprits possesseurs. Avec un rire soudain, et un brusque saut de côté, elles se jouent du spécialiste qui s'imagine les avoir épinglées sur son tableau synoptique. Ce qu'elles exigent de nous ce n'est pas de monologue d'un officier de police judiciaire, mais le dialogue d'une conversation vivante." spatial semantics : Ancient Egyptian hieroglyphic writing was more than a way to convey well-formed meaning (i.e. language), but tried to invoke the magic of the "numen praesens", involving the use of artistic space (a contemporary equivalent is the Zen garden) as a additional element in the composition of meaning. The Shabaka Stone, is only one (late) example of the principles of spatial organization which governed Egyptian from the start (besides honorific or graphic transpositions). Unsightly gaps and disharmonious distributions were rejected. Groupings always involved the use of imaginary squares or rectangles ensuring the proportioned arrangement. This allowed for slight imperfections. Furthermore, important hieroglyphs were given their architectonic, monumental or ornamental equivalent. Spatial semantics was at work in large monumental constructions as well as in small stela or tiny juwelery and important tools (for Maat is at work in both the big and the small) ... Egyptologists have not given this aspect of Egyptian "sacred geometry" the attention it deserves (besides Schwaller de Lubicz), leaving the horizon wide opened to wild stellar, historical & anthropological speculations. metaphorical inclination : Ancient Egyptians "spoke in images". This holds true in a linguistic sense (namely their use of pictograms), but also with regard to their literary inclinations. When somebody grabbed his meat violently, the Egyptian thought of the voracious crocodile who has no tongue and who has to grab his food with his teeth and swallow it in one piece. When they saw the Sun rise and heared the baboons sing, they associated this activity with praise and the glorification of light, etc. Some hymns speak in images, poetical phrases, metaphors and other sophisticated literary devices. Literary and metaphorical meaning overlapped and interpenetrated (for example : "He who spits to heaven sees his spittle fall back on his face.) ... The epithets of the deities too are full of visual elements. Some egyptologists tend to rewrite this to comfort the contemporary readers. This offends the fluid nature of the texts and makes them dry and gray. The contrary (leaving these images intact) works confusing when Egyptian literature is new. As a function of their intention to try to really grasp the sense, translators make a compromize between literal and analogical renderings. I myself tend towards the analogical (which was closer to the Egyptian way of life), leaving room for explicative notes and comments. "The only basis we have for preferring one rendering to another, when once the exigencies of grammar and dictionary have been satisfied -and these leave a large margin for divergencies- is an intuitive appreciation of the trend of the ancient writer's mind." It goes without saying, that all the hermeneutical rules-of-tumb in the world will not guarantee a perfect translation, which simply does not exist. The Italian dictum "traduttore traditore" (the translator is a traitor), is especially true for Egyptian. As with all texts of Antiquity, large scale comparison is the best option. Not only has the text to be contextualized, but one has to acquire the habit of looking up the same word or expression in various contexts across time (lexicography). But even then, one should be content with Gardiner's view that to circumscribe sense is the best one can do. "Although we can approach its grammar in an orderly fashion (...) we are often puzzled and even frustrated by the continual appearance of exceptions to the rules. Middle Egyptian can be especially difficult in this regard ..."